On Saturday Elena turned five. FIVE! My oldest daughter has reached the age of actual childhood. 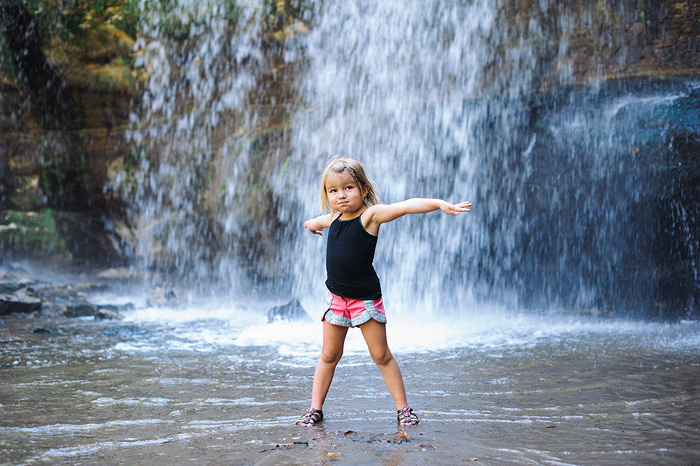 An infant or toddler no longer she’s officially growing up – though, like her mother, her stature would suggest otherwise. Normally on her birthday I write a blog post to her – recalling the last year of her life and offering wisdom for her future. Last year, I imparted the wisdom of Tina Fey upon her, and I recounted her favorite improvisational story based on her affinity towards a very un-ladylike bodily function. This year isn’t any different. Well, she is different, but my penchant for sappy recollection remains unchanged, so if you’re not into letters-written-to-children-on-blogs-when-they-can’t-even-read-them, then I suggest you turn away now. This is going to get sappy…. You are absolutely a work of art, child. Your smile, your laugh, the way you create princess dinosaur games and play “Baby Tiger Saves the Bird” with your sister melts my heart. Your imagination is unparalled and I could spend hours just watching you dream up magical worlds to live and play in. You don’t like to clean, and you won’t eat anything (except spaghetti and pancakes), but you love ballet and swimming and Katy Perry. Being your mom is difficult, but not for the reasons you might think. Not because you don’t listen sometimes, or you fight with your sister. It’s difficult because I’m not there – with you – nearly enough. I don’t get to hear you laughing as often as I like, or kiss your scraped knees. I don’t get to watch as you learn new things at the Science Museum, or as you explore new animals at the zoo. And that, darling girl, is the hardest part of being your mommy – missing the parts of your life that are so fleeting and precious. And I am happy you let me make it up to you with dance parties and tickle fights and movie nights snuggled on the couch. These are the moments that I carry with me. The ones I look forward to. I’m so incredibly blessed every single day for every single moment we’ve spent together – for every single breath and kiss and hug and accidental punch in the face. Five years have passed since you came into my world and changed it forever, and in those five years I’ve amassed an abundance of memories of you. You’ve grown into such a magnificent little girl, full of her own wit and humor, and steadfast and strong. I’m thankful for all that you are and I can’t wait to see what this next year brings for you! sniffles. What is more rewarding then being a mother, nothing.